*Warning* I’m going to be talking about poo removal. If you don’t want to hear…or see it…just keep on keeping on. But if you are wondering what do to with the poo after your baby starts solids, this might be interesting AND USEFUL for you. It is just like it sounds. You can get more info by clicking the link above. I find this to not work for me. The thought of letting my cloth diaper go for a swim in the toilet while I guide it around the bowl is just more than I want to handle. I’m not knocking it, because it does work, but I am glad there are other alternatives. The liner catches most of the poo. But they shouldn’t be flushed because they can clog sewer and septic systems. That means you have to have a trash available to dispose them in. I personally only have my kitchen trash can. Not the place I want to be putting poo filled liners. So this method also didn’t work for me. I find this to be the easiest and most effective. You don’t have to touch toilet water. And with the Diaper Dawgs Spray Collar you don’t have to get take a chance at getting any poo water splashed around the bathroom either. I call that a win! The Arctic Wolf Spray Collar attaches to many commercially available diaper sprayers (including bumGenius, Knickernappies, OsoCozy, Blueberry Flo, Bumkins, and Amp) or you can purchase a sprayer directly from Diaper Dawgs. I hope to try one of Diaper Dawgs sprayers in the future because I’ve heard good things about their AIO Toilet Sprayer and the Hot Dawg Shower Sprayer. The Shower Sprayer attaches directly to your shower head and comes with a long hose. This method allows you to use HOT water to rinse if you want! The new Arctic Wolf Collar is a crystal clear, non-porous TPU that won’t hold onto bacteria. It’s easy to use and easy to clean. There’s no taking it on and off. You put it on once, and it stays there ready for each use. To better explain, I hope you check out this video made by Aisha, the creator of the Diaper Dawgs Spray Collar! 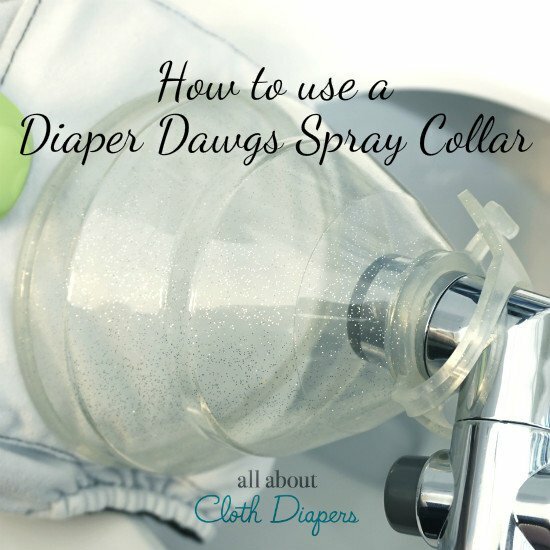 Have you ever used a Diaper Dawgs Spray Collar? I’d love to hear what you think!